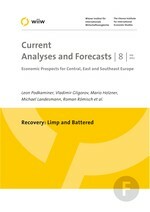 In 2011 we expect economic growth to reach 5% in real terms. Gross capital formation will again be the strongest driver of the upswing. However, also a slight increase in household consumption will back up domestic demand. With the move of the current account into deficit, net trade again starts to contribute negatively to overall growth. Economic activity is likely to abate somewhat in 2012 and 2013 compared to this year. The strong revival of exports will subside, but domestic demand should regain some momentum due to rising wages and a revival of lending activity. Thus we expect GDP to grow by 4.4% and 4.6% respectively in real terms in the subsequent two years.